We have kept to the coast and the sun has stayed with us and then some. We hoped for some sunshine whilst we were up here but we have been totally spoiled with blue skies and the thermometer reading over 24 degrees and up to 28 degrees all week. The good weather and our love for the area have combined to mean we have stayed a week longer here than we planned or expected. 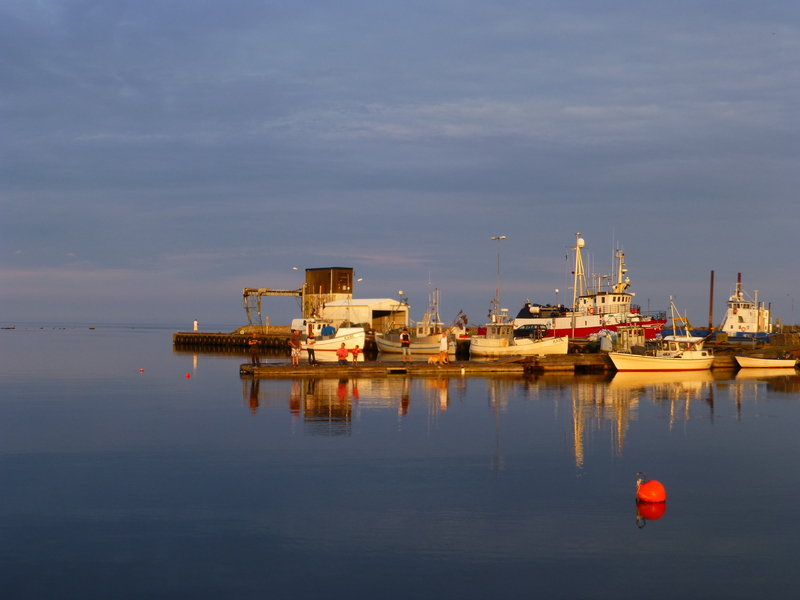 The South East coast in Sweden is, be their own admission, overlooked for tourism. Considering its the worlds biggest archipelago, with over 30,000 islands, skerries and islets, it’s amazing to us that the tourists don’t flock here. To be fair the main attraction is the sea, islands, more sea and then some more islands. But if you like those things, as we do, then it’s a pretty amazing place. The majority of visitors come in by boat or yacht, there are marinas large and small on every cove. Talking marina here is much less than talking them at home, here more a small harbour with maybe a cafe, basic facilities and space for half a dozen boats. That said some very exclusive and expensive vessels pull in for a night or two. We pottered down as far as Monsteras, saw it was flat with plenty of cycle paths so we pitched up for a couple of days. The village itself had a church, a few shops, a Wok’n’Go kiosk and not much else. It’s major claim to fame apparently is its links to the writer of the hymn “How Great thou art”, Carl Boberg. Other than that it was just small town with an impressive cobbled main street, pleasant enough to walk around for an hour. We found our favourite ever Tourist Information centre in Monsteras, they didn’t just give us leaflets, they gave us a whole goody bag – a bag (obviously), pens, soft drinks, sweets, water, bottle opener, trolley coin and of course a ton of literature. Little things, but they make all the difference so first impressions were great. Based on this we took their tip of visiting Pataholm. I was reasonably sure it was 7 or 8 miles, I must have mis-read something though as it was 16 miles each way! Long hot cycle ride so we were hoping for something pretty special when we arrived. To be totally honest Pataholm wasn’t jaw droppingly amazing – it was just 10 or 12 very cute cottages on a cobbled street. With only 20 residents it was never going to be a massive town but it was once a market town for the area and they have beautifully preserved the buildings turning them into cafes and craft shops. It seemed safer to let Iain chose the next destination, we cycled straight down to Okno, a small island liked to the mainland by a causeway. 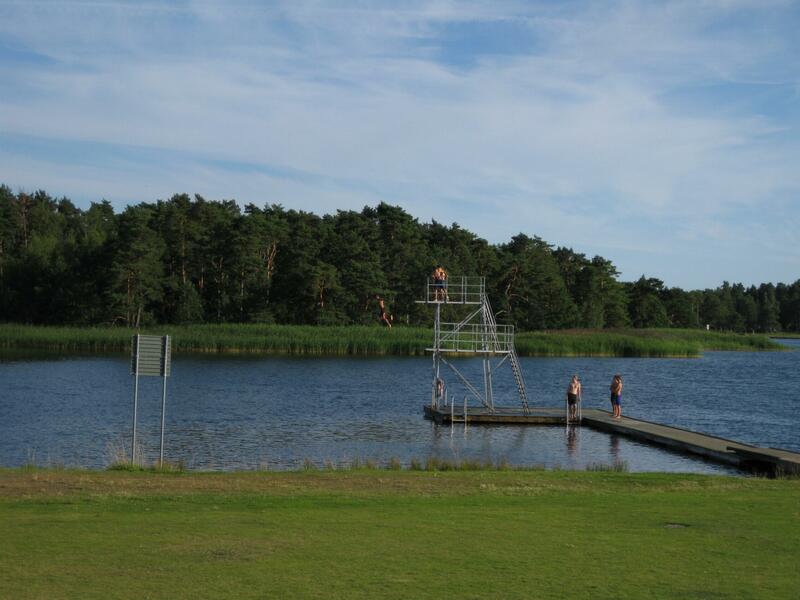 As with everywhere we have been in Sweden the local children were congregated around a diving platform – as soon as the sun shines the Swedish youngsters appear to head for the water, fun for them and very entertaining for the holiday-makers to watch :). The island of Oland was down on the list for at least a night. 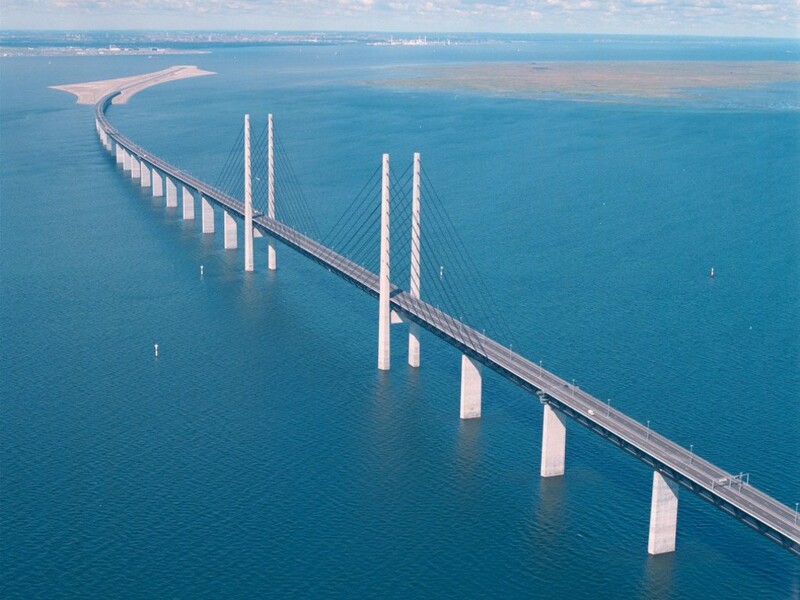 We drove over on the imaginatively named Oland Bridge (6km / 3 mile and toll free – bargain). On arrival we were both a bit under-whelmed, the roads run along the middle of the island only glimpsing the sea. We stopped off to have a look at some of the famous windmills, and both agreed not to go any further along the island road. With it being a roasting day and the weekend coming up traffic was queuing back over the bridge – all in all it wasn’t going to be for us. 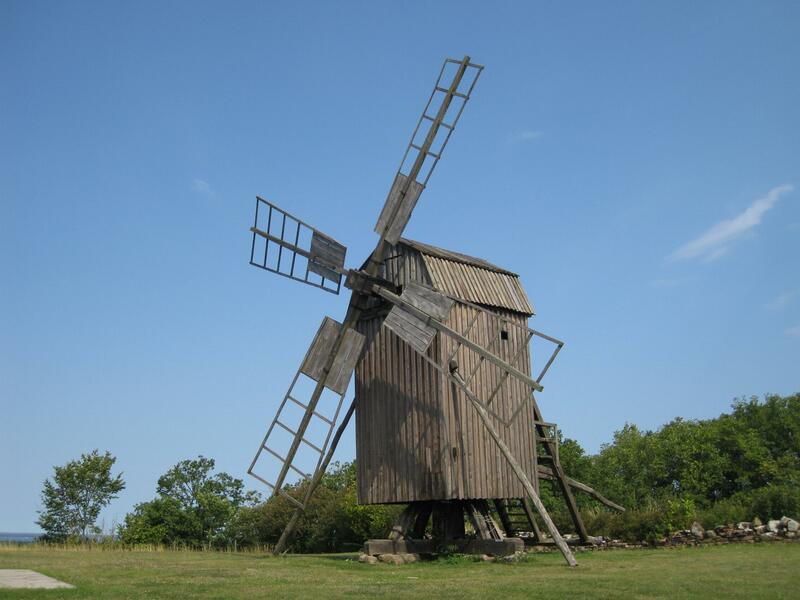 Instead we aimed for Sandholm – a little spot of nothing in the far South East. 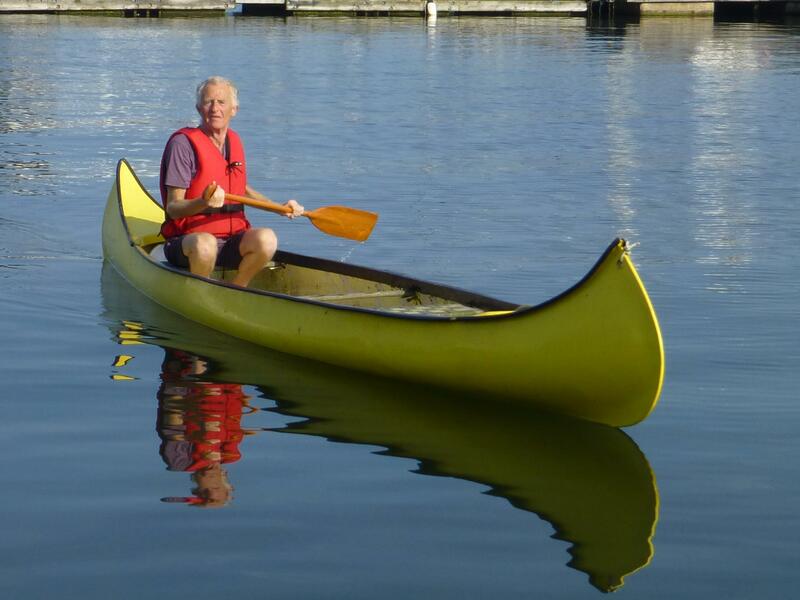 The two guys who run the marina here kindly offered Iain the use of a kayak! No instructions, no nothing just a life jacket and in. 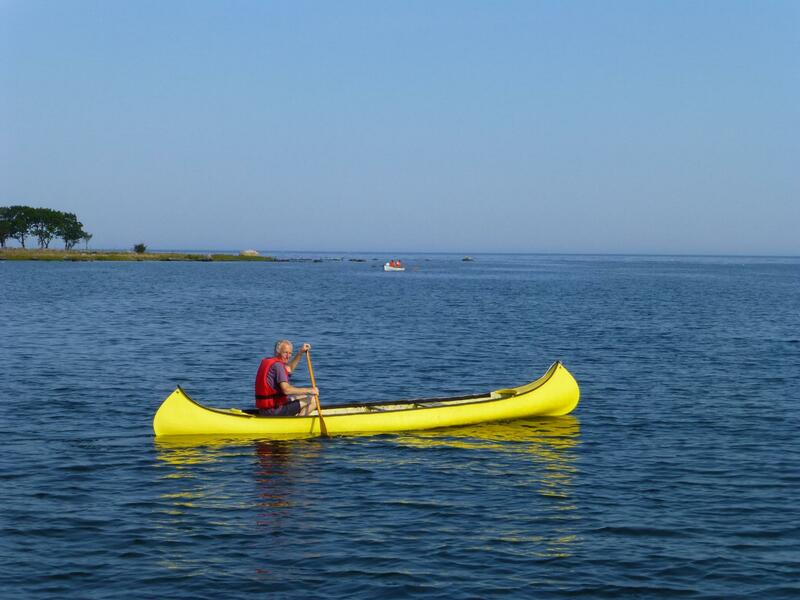 My heart stopped several times before he left dry land – as he paddled away the harbour-master and a couple of sunbathers were loudly humming the theme tune from “Jaws” – gives you loads of confidence then! Call it what you will but we are struggling to move on from Sandhamn. 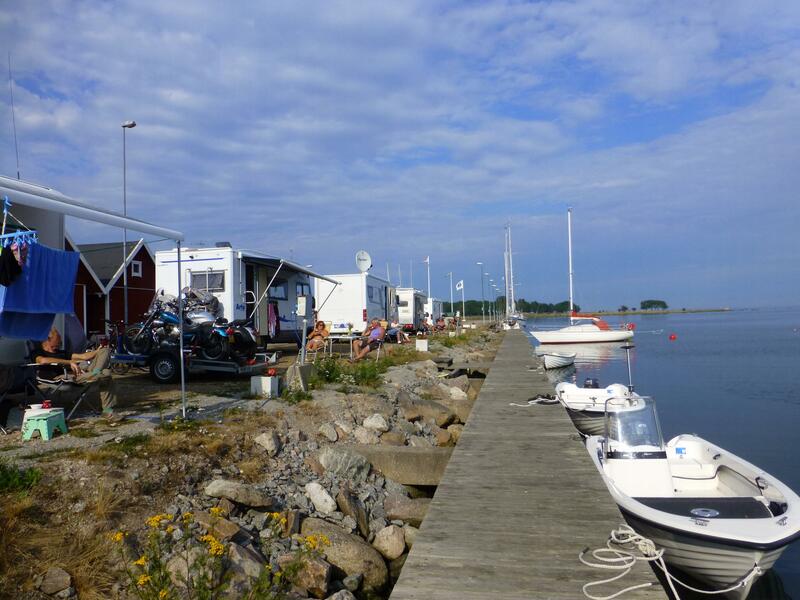 The harbour consists of a few guest moorings and several spots for motorhomes. there is a cafe, a supermarket 10 minutes away and a nature reserve which stretches down the peninsular. 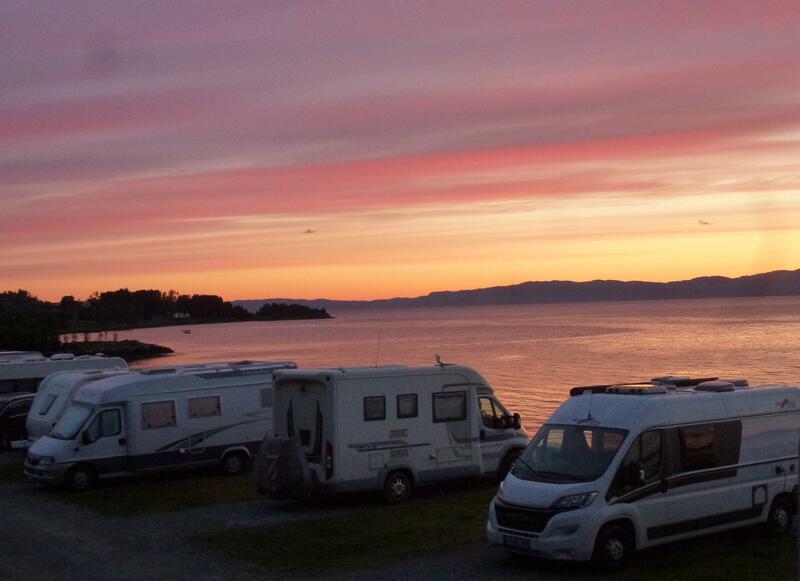 Whilst there are a good few boats and motorhomes here its very peaceful. The main activities here are fishing and sunbathing – I have joined in with the latter were Iain has been out partaking of the former. Last night most people were still sat outside at 10 pm watching the sunset, a few drinks were passed around and we were invited over by some Swedish people for a drink and a chat about travelling. All in all it suts us well here, we should be moving on but just paid for another night so we are here for a bit longer. We agreed to take the East coast route down so had a stopover at Vasteras, one of the bigger towns in Sweden, before we hit the coast. The entertainment for the day and evening was provided by a snazzy zip-wire come wake boarding school outside the front window. Think water skiing on a board but being pulled by a zip-wire rather than a boat – amazing people doing amazing things on a bit of wood and a wire, we would have paid for the view but luckily it came in with our parking spot. On route down we needed LPG, first obstacle we faced was none of the garages sell it – fail to us, we forgot to check availability and found that there were only 30 suppliers in the whole country. We found one at Falun, closed on Sunday, so instead went for Eskilstuna where lucky for us we found a gas supplier – who happily tried to top us up, only to find the tank wouldn’t totally fill. When we stopped off at the marina Iain rang the LPG system suppliers in the UK, who spent half an hour telling him how to fix the problem – seemingly we have at some stage over-filled the tanks. After freaking out the motorhome next door and a yacht in front of us with several large emissions of gas we hope we are fixed – and have enough gas left for the next 2 weeks until we test refilling in Germany. It would seem repetitive to mention the roads and how quiet they were, but again they were – Sweden is empty. it’s all lakes and forest. We drove over the bridge on Hjalmaren Lake – over 480 square kilometres and 58 km long or lake – that is the same size as Andorra. Standing on the road side we could see false horizons but not a soul on the lake in any direction. 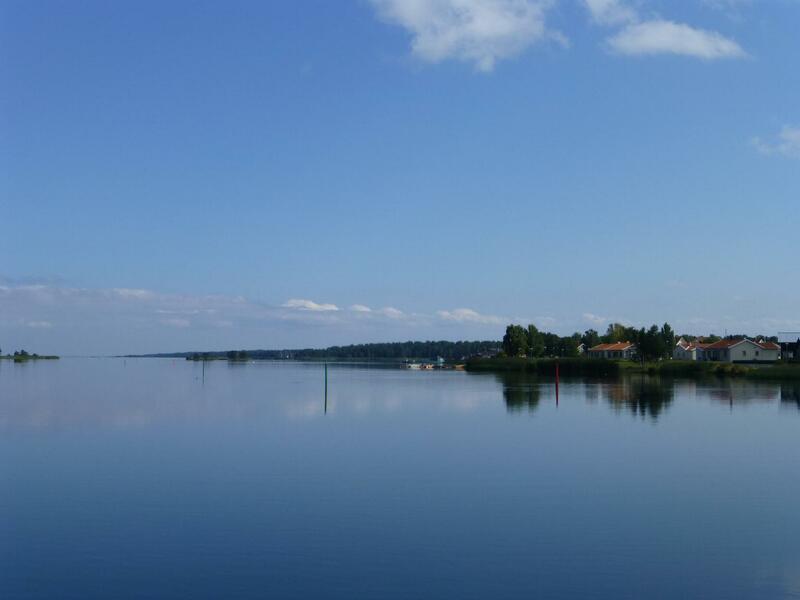 One of the most magical things about Sweden is the sense of space amongst all the amazing views. 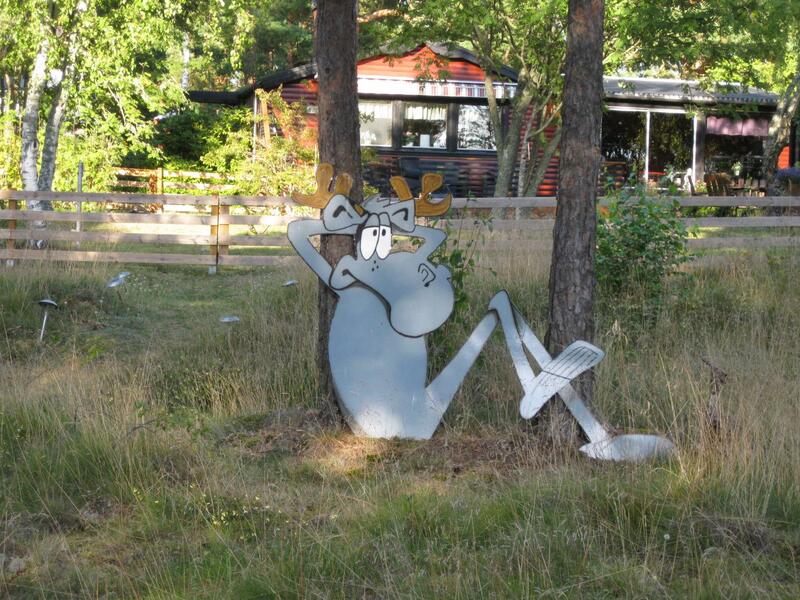 The holiday season in Sweden is incredibly short, it starts mid June and ends mid August. Just 2 months then tourist stuff starts either closing up or reducing hours. At the moment most things seem to be open until 9pm-10pm at night, that includes anything from big shops to little ice-cream stalls. The vast majority of people on holidays here are Swedish, we have seen very few other nationalities. In the last four days we have seen one Dutch and three German vans – whereas in Norway we were seeing that many Dutch and Germans every hour. We did meet an amazing English lady last night. 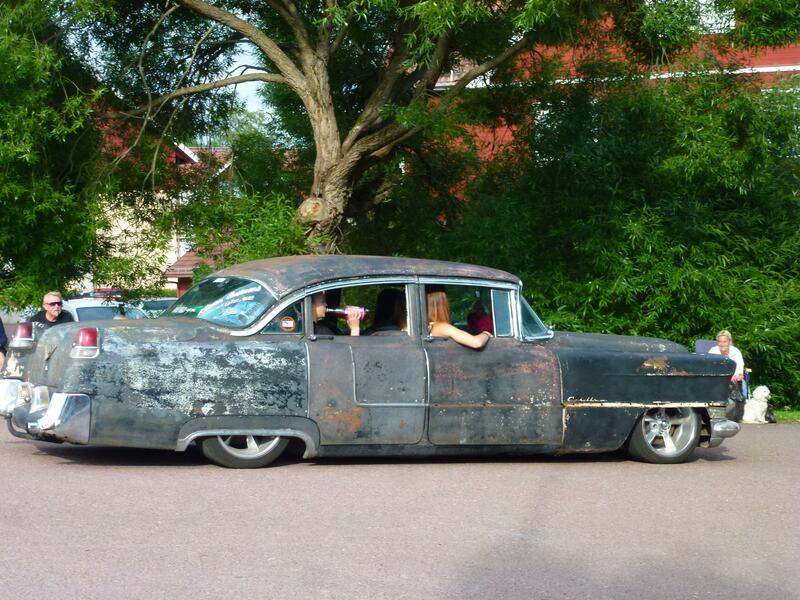 She is sem-retired and touring Sweden and Finland. She is on her own, driving a 4×4 with a canoe on the roof and that’s it. She sleeps in the back of the car and uses public loos and showers, cooks with a small stove outside her car and camps out in the woods on her own. A very gentle lady, polite, well spoken, retirement age – the biggest thing was she is doing it – no moans that she doesn’t have a motorhome or can’t afford hotels, just enjoying it the best she can. We were both a bit humbled by her story and more than a little impressed. 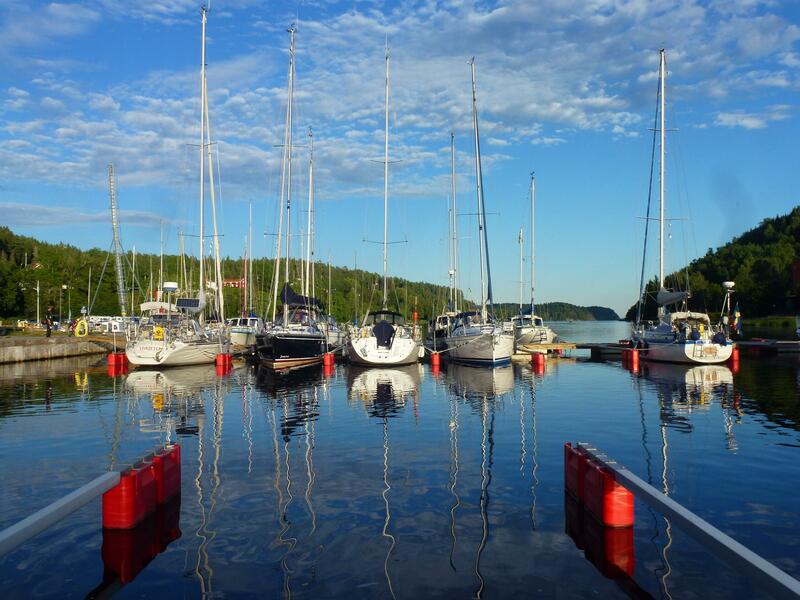 As the weather has turned to Swedish summer we have had a couple of days parked up in Valdemarsvik, as is now our usual on the local marina. We cycled up a former railway track to the next town but other than that we have spent our time just sitting and watching the yachts come and go, topping up our tans and generally watching the world go by. Last night we were treated to the peculiar Swedish phenomenon of Allsangsmandag. 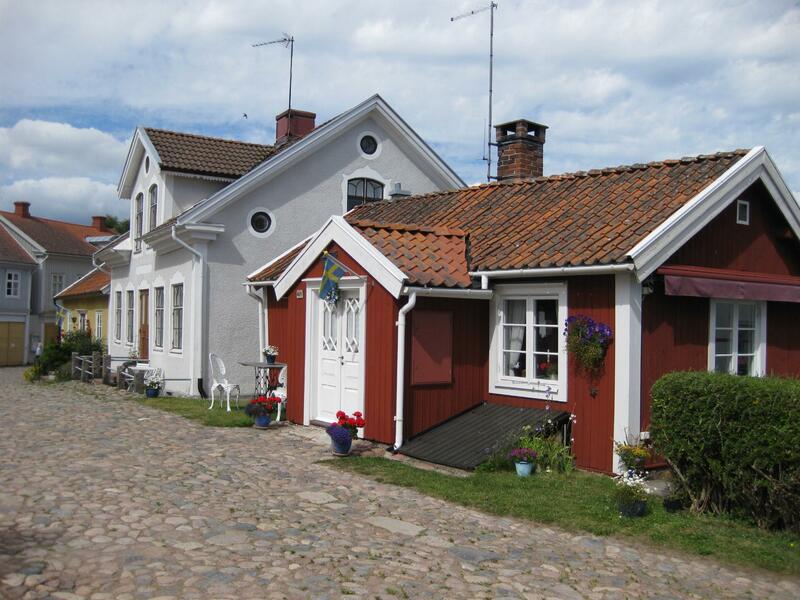 It is said here you have not experienced a Swedish summer if you have not been to an Allsang, they are mad about them. The concept is the same be it on national television or in every village and town in the country. Half the town turn up with picnic chairs and sit around a stage set up in a 40ft truck. 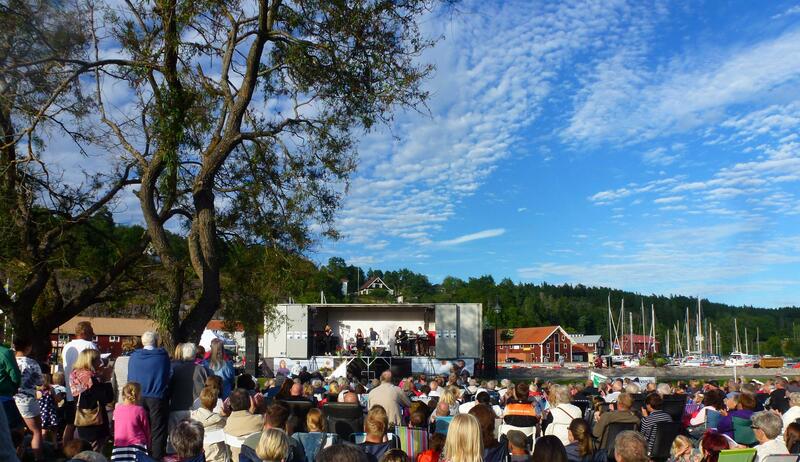 There is a pop-group with celebrity guests, some singing of traditional Swedish songs, then members of the audience get up and sing with the bands to modern chart stuff – but the best bit is the audience are given song books with the words to join in with the bands on several songs. The majority of songs were of course Swedish but a fair few English ones in there – we were awesome and did the British proud :). If Allsang isn’t on British tv in 12 months I will eat my hat – it’s going to catch on, hopefully! You can’t beat a bit of Allsangsmandag! The other strange obsession here is ‘Loppis’ – flea market, garage sale, boot sale – call it what you will, you cannot fail to come across one. In the back of regular shops, outside supermarkets, in peoples gardens they. It’s not what they sell that is remarkable, its the number of them. Here on the harbour there were four Loppis huts, a Loppis in the corner of the bakery and even in the loos one of the small storage rooms had been converted into a self serve Loppis. The GDP of Sweden must be impacted by selling junk as we have never seen so many people doing it anywhere else. Tomorrow a bit further South, keeping to coast and hopefully keeping with the sunshine. 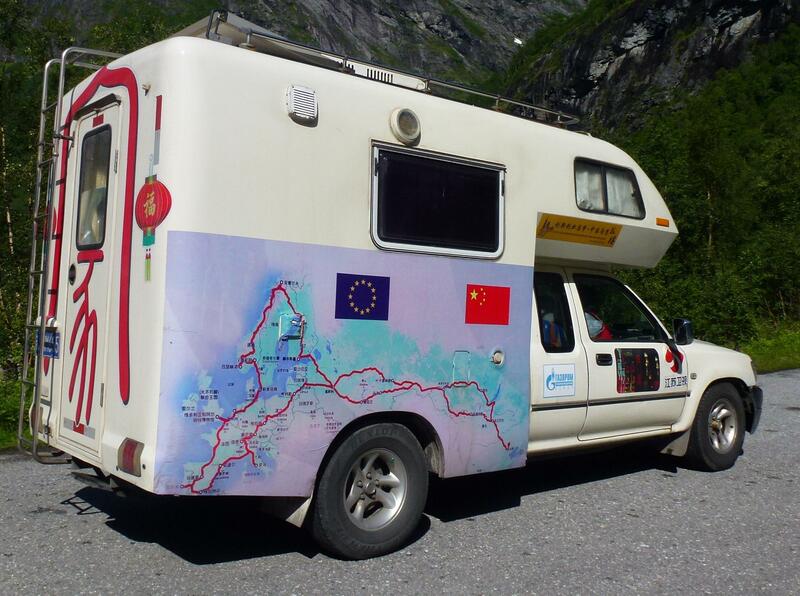 We came across this little moho the other week, their trip detail on the van puts ours to shame! Our grasp of Swedish is limited, we have though taken to the local greeting. 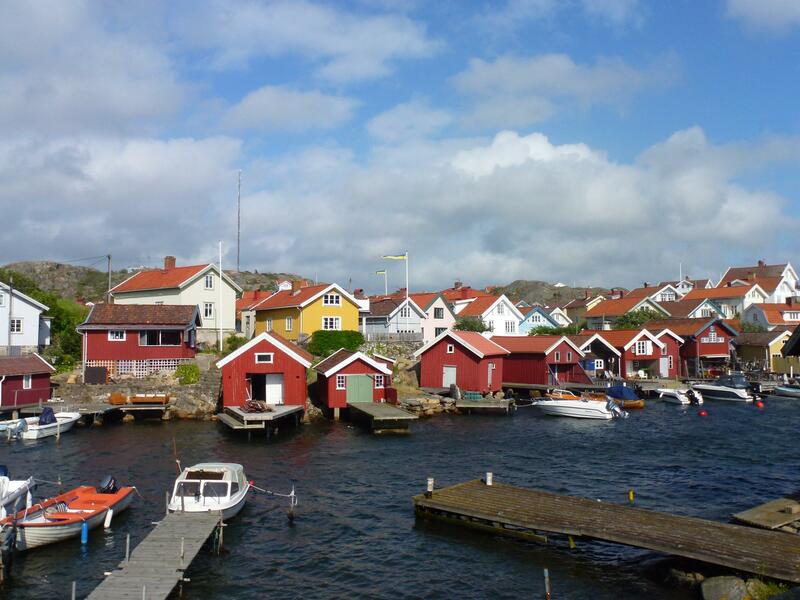 Everyone, be they four years old or 94 years old, uses the greeting of “Hej, Hej” – it’s a sunny expression that is always accompanied with a smile. As importantly we can pronounce it so it’s a winner all round. 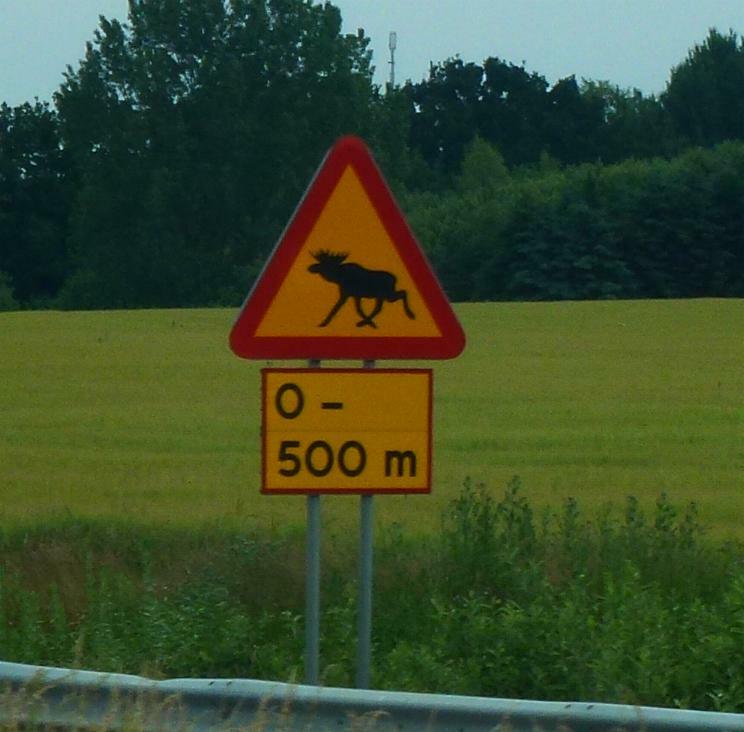 We have ambled down through Sweden on more or less straight roads, mile after mile after mile of pink tarmac, through forests with the odd lake at the side of the road. Whilst its been single lane it hasn’t mattered as there was very little traffic. Every so often a ‘one elk town’ came into view but within a nano second we were out the other side. We drove over 120 miles and it was possibly the least stressful piece of road we have yet to come across – the E45 is now our official favourite road! Parking up for the night has been a matter of the side of the road along with caravans, tents and even a Danish couple eating and sleeping in their yacht on a trailer. 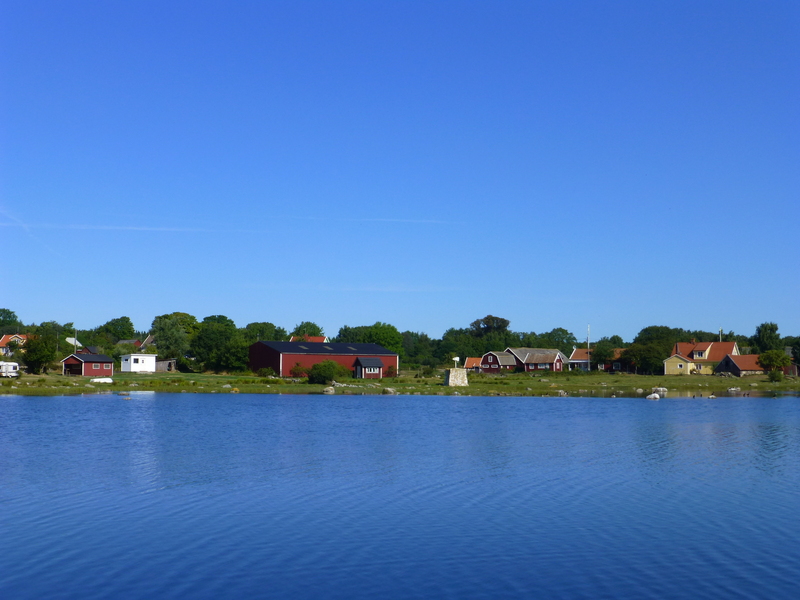 On Thursday we planned to visit a small lake where we had read there was a quiet camping spot, when we arrived it was like hitting a mini-metropolis in the sticks. 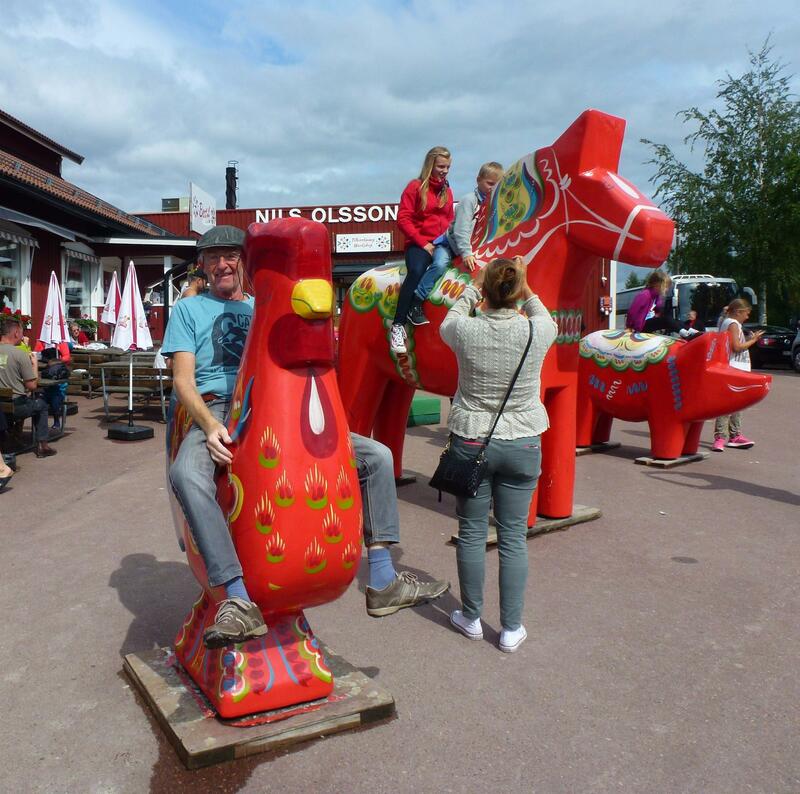 It took us a while to work out, three wooden buildings, several rough car-parks and lots of very tall painted wooden horses – along with one or two chickens. He sat on the chicken because he couldn’t get a leg up on the horse! 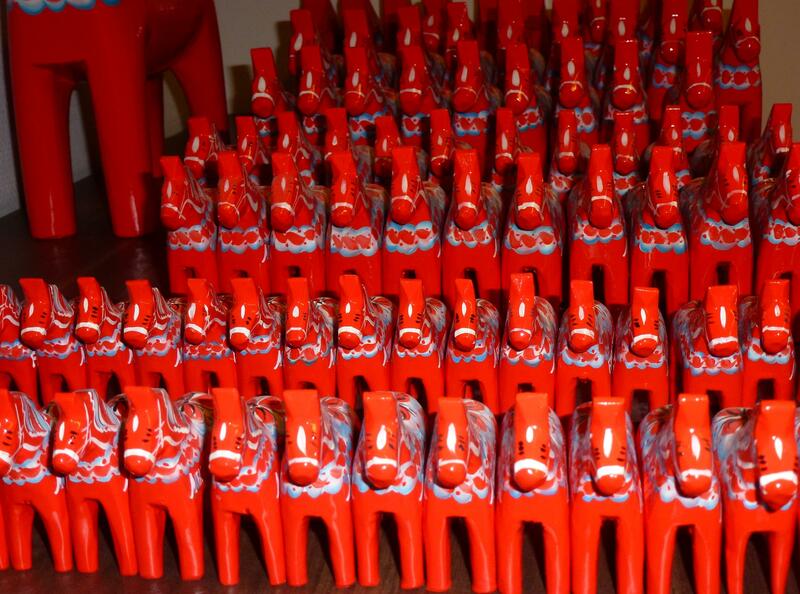 We had arrived at the Grannas Olsson factory in Nusnas, famous as the home of the hand-made Dala wooden horses. The carving of wooden horses in the region dates back to the 17th century, and the same traditional methods of carving and decorating are still used. A walk through the factory showed everything really is done by hand from the original wooden blocks being carved, sanding of each horse, painting and laquering – you can watch every process taking place. As the horses are carved by hand no two are exactly the same, well maybe one or two are as there were thousands of them in various stages of carving and painting along with several hundred herds for sale. Ranging from a few inches high to over 20 ft high you buy them at pretty much every size in a dazzling array of colours, or though red seems to be the most traditional. We shyed away, :), from staying overnight as there wasn’t room to breathe in the car-parks and instead moved onto Mora. Iain had mentioned a couple of times the number of classic American cars on the road, by early afternoon they were outnumbering regular cars. We pulled into the teeny village of Vikarbyn and found a campsite, even on the campsite there seemed to be classic 1950’s cars everywhere. Chatting to some locals we discovered that we had hit “Cruise Week”, week 31 is traditionally the week when somewhere in the region of 2500 classic car enthusiasts from all over Sweden descend on Rattvik to cruise and show off their cars. Several hundred are registered for displays and events but the rest just turn up, take part and enjoy. Thursday being their last night they put on a cruise display from Rattvik through several of the villages, we watched for over two hours and there was no sign of it ending. It was full on stuff – they don’t just drive the cars here they live the life! Cars are piled with bodies, the outfits scream 1950, a bit odd when the radio is blaring out a song you know you know but the lyrics are being sung in Swedish. Several of the cars were staying on the campsite with us, with their retro caravans, all of whom shared their love of 1950’s music with us through the night until daybreak! Next morning we left the campsite, memorable as our first ever Baptist campsite – where New Testaments were hung on string in each toilet to encourage a bit of bible reading whilst you, you know what! 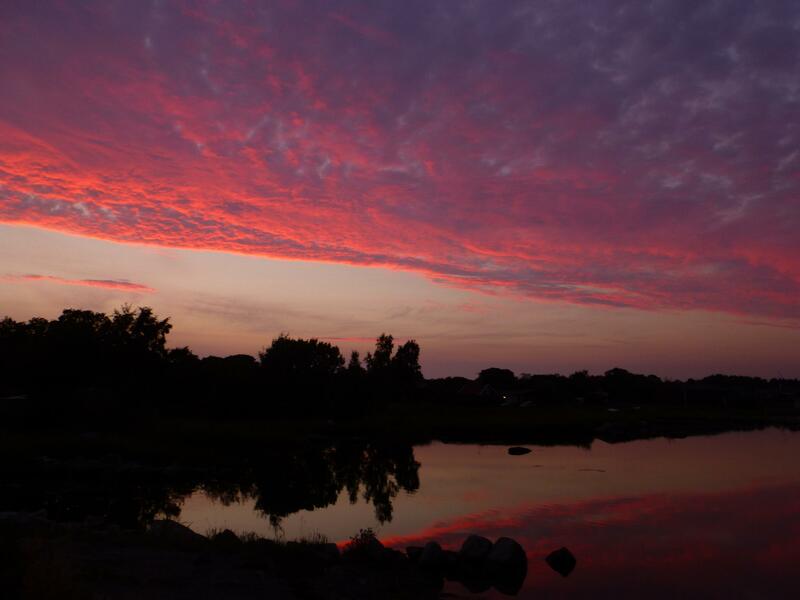 Two very different sides of Sweden in one night :). 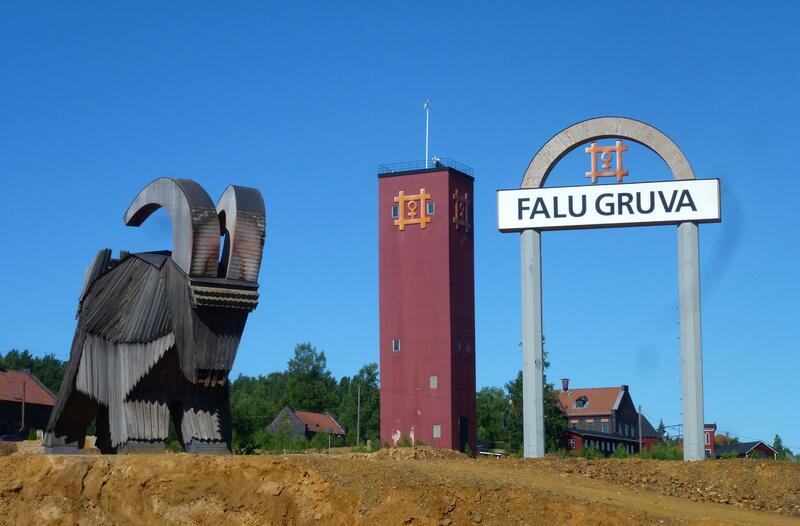 Next stop Falun, a small town with a massive copper mine, now Unesco listed as one of the important industrial sites in Sweden. The copper from the mine was used for the production of castle roofs, church steeples, coins, and household utensils all over Europe. It looked as interesting as a mine can (to me) but as we had done the Salt Mines in Poland we made do with a look at the outside only. We found a little campsite next to the lake on the edge of town and went off for an explore on our bikes. We were looking to visit Lugnet, the sports complex which is home to the Swedish National cross country skiing and ski jumping teams. Cycling to a ski jump wasn’t one of our well thought out plans, a 6 mile up hill ride, fair killed the both of us. The 2015 World Cup ski jumping was held here a few months ago and even in the middle of summer it’s a busy place with over 60 different sports practised at the centre. 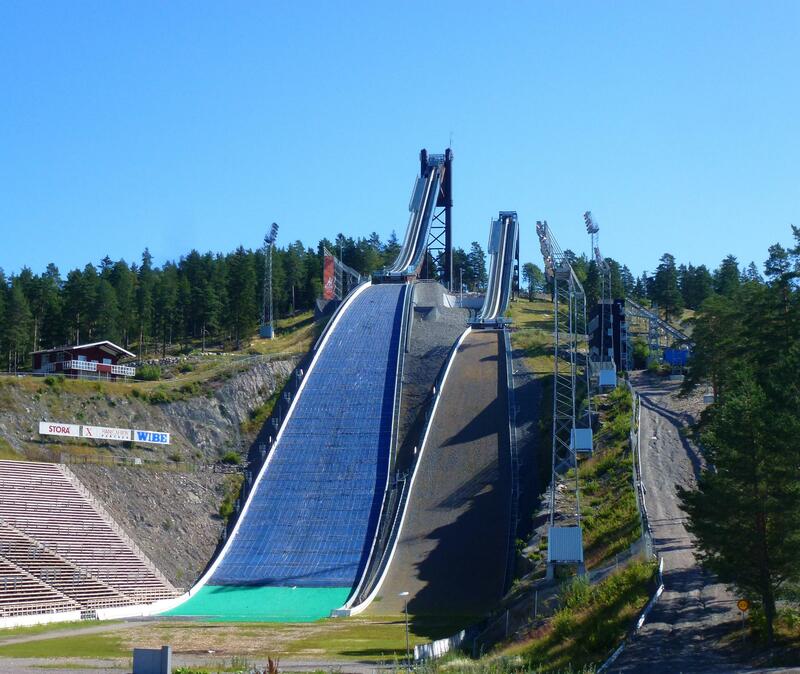 The two ski jumps defy belief in the size of them, whilst we knew they were massive it”s only when you stand near them you sense the true scale – which I would describe as frightening. Anyone who thought Eddie the Eagle was a wimp wants to come and stand at the bottom of this jump let alone sit on the bar at the top. Back into Sweden on the E14, we thought it would be a busy dual carriageway but just a good main road that took us over the border and up high over the mountains and through the ski resorts. Whilst there aren’t many skiers around there are a surprising amount of holiday makers in the mountains, the scale of the resorts was much larger than anywhere else we had been, hundred upon hundred of chalets together with some very impressive hotels. A few ski lifts open taking walkers to the mountain tops but we resisted the urge to go up as low cloud was obscuring the views (my excuse and one I am sticking with). Arriving in Jamtland our first attempt at a stopover was at a large ski hotel complex, one of those closed for the season but with a large poster saying feel free to stay for night, the showers and loos are unlocked and heated and leave some money in the letterbox! Only that it was right on the main road did we not – so close to home and yet such a difference in terms of trust and honesty. 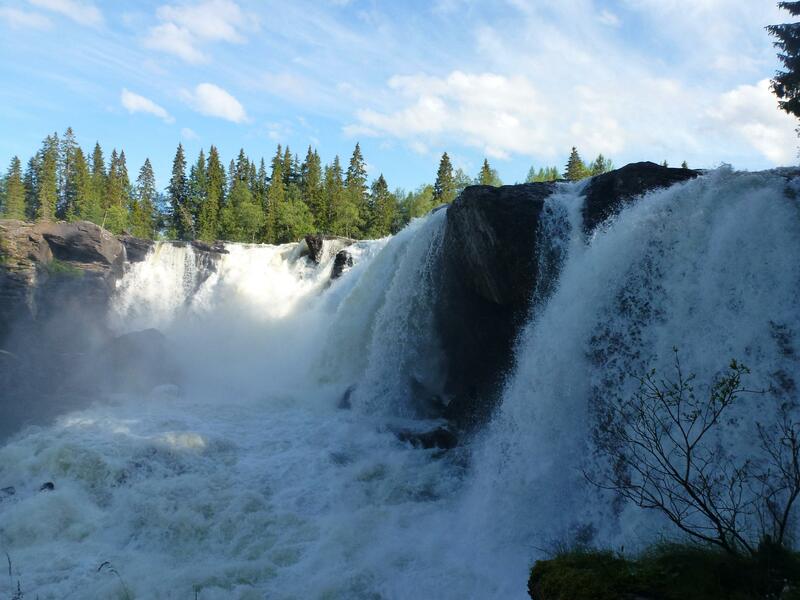 We had our first couple of nights at Rista, a small dot miles away from anywhere or anything except the 50 metre wide and 14 metre deep waterfalls. The sound of the river and the falls drowned out pretty much any other noise. Incredible amounts of water and nearly as incredible the number of walkers that appeared out of the trees from early morning through till very late evening. St. Olaf’s Pilgrims walking trail ran through the centre of the campsite , hence the amount of modern day pilgrims. We walked a section of the trail that followed the falls down stream, every so often someone had kindly left a wooden bench or small hut or a fire pit ready for the next set of walkers. No matter what is left out and where, it seems people are able to resist either removing things, spraying them with paint or just smashing things to pieces. After a couple of nights listening to the falls we agreed to move to calmer water, just under an hour down the road at Mattmar on Lake Storsjon. 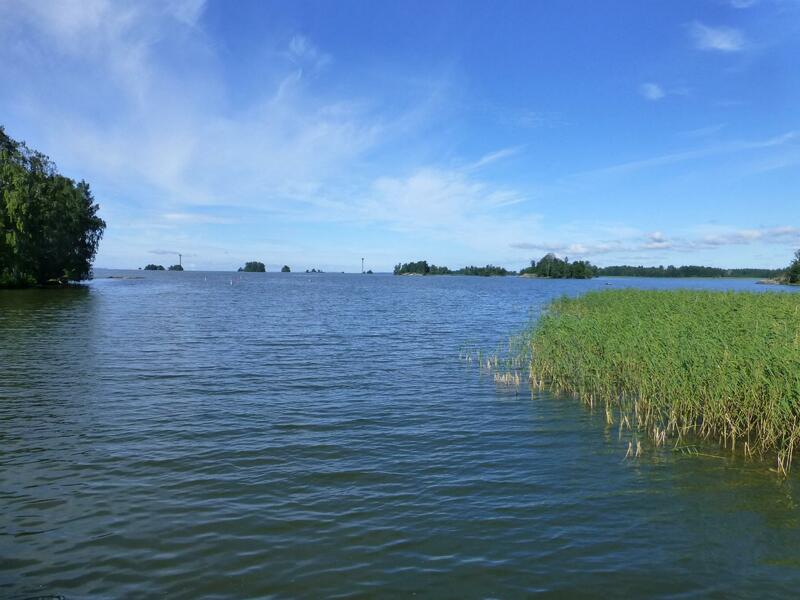 The fifth largest lake in Sweden at 464 km2 and one of the more famous as it’s the only one reported to have a lake monster! 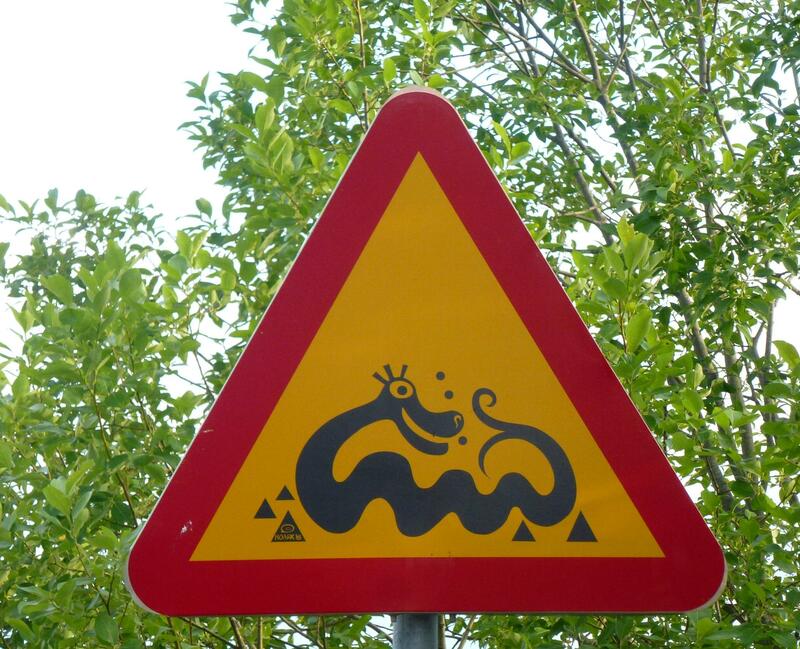 First sighted in 1635 and known as Storjoodjuret it’s apparently still spotted on the odd occasion, warning signs abound on the edges to be careful :), we were and can report we didn’t see anything resembling a monster. We found ourselves outside a café and a tractor museum, a small piece of land in front of a couple of fishing boats and £10 to stay over, as the sun was doing overtime we elected to stay for 24 hours – sadly when the sun went on a tea-break the mossies came out – feasted on my arm – and left me looking like a relief map of Sweden. 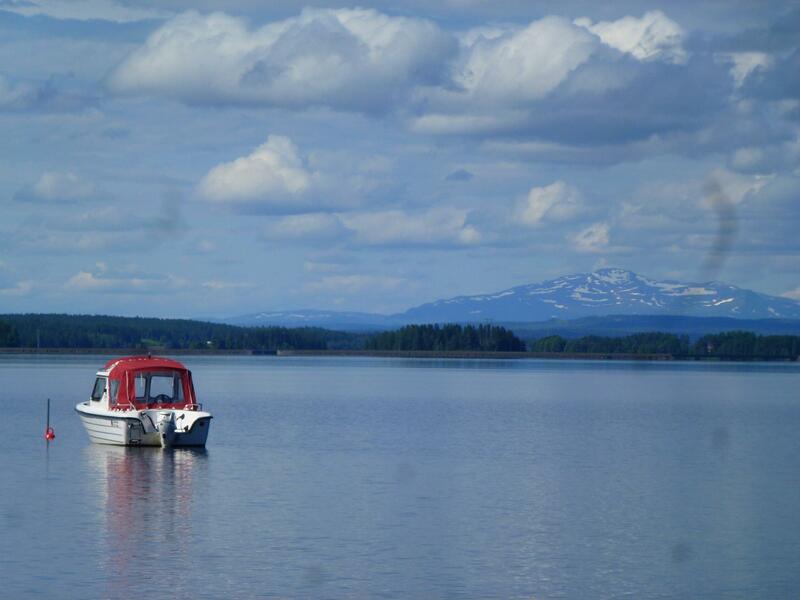 Once everywhere had closed we were joined by another four motorhomes and spent a quiet evening watching a local seaplane take off and land on the lake in front of us, the odd fishing boat come and go and a couple of people fishing out on rowing boats. 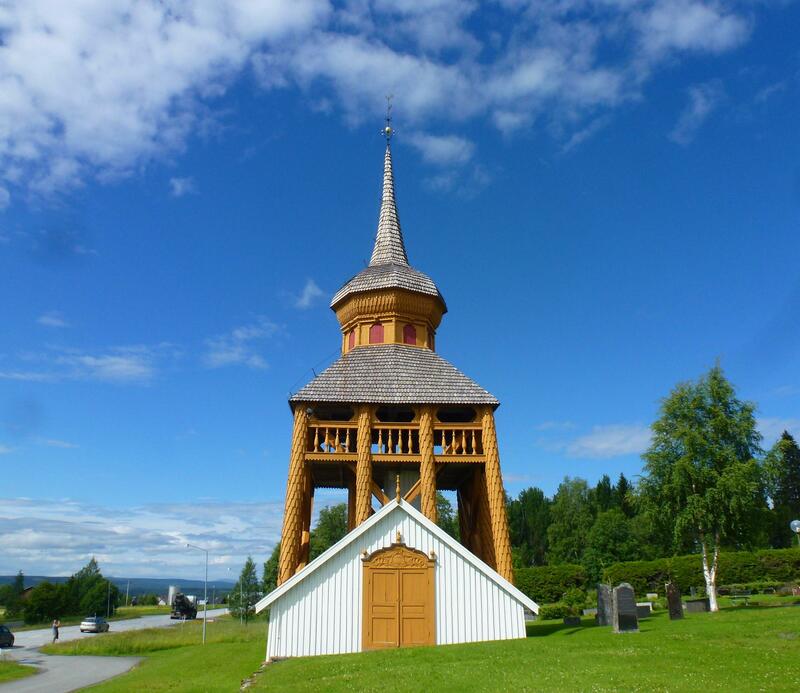 Heading slowly South we have passed a few churches with a wooden bell tower outside which are common in Jamtland. 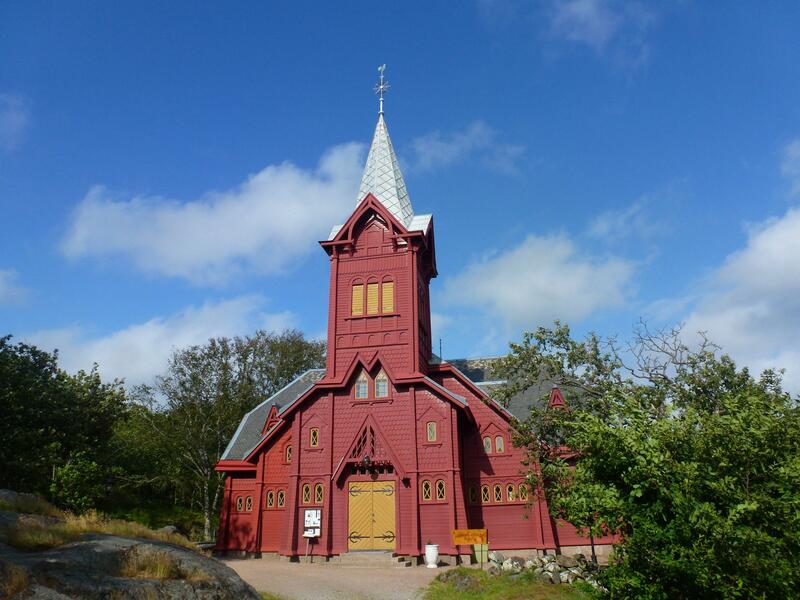 Mostly built around 1736-1780 the towers are wooden and painted in the bright colours first used in the late 1880’s. Inside the church the pulpit had been painted in 1662 (the date painted on gave the year away), and next to it stood an ornate font – carved from a single log, crowned by a wooden pelican – being the symbol for Jesus in the region. Our route down over the last few days has taken us as far at Ytterhogdal where we are parked up behind the Tourist Information office for the night. 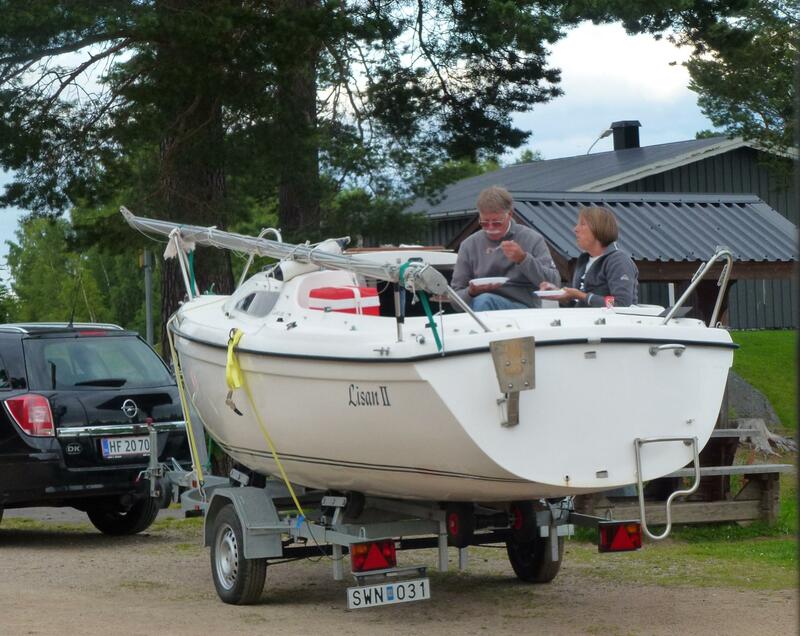 As seems to be the case at every stop in Sweden we are beside a lake, this one has a few small boats chasing around with the local teenagers towing tyres containing other teenagers. Despite the fact that the water temperature must be pretty cold this far North there are a good few in swimming, the radios are on loud so we may have stumbled onto the local night spot for late night water play! Back in Sweden this seems like a very different country to the one we hopped through a few weeks ago heading into Norway. It feels very much like a wilderness, the main roads are long straight and wide, we have seen very little traffic of any sort over the last four days, what traffic we do see has at least five spot-lights and bull-bars. There are small communities dotted around where there are a few shops, a bank and a garage but very little else. 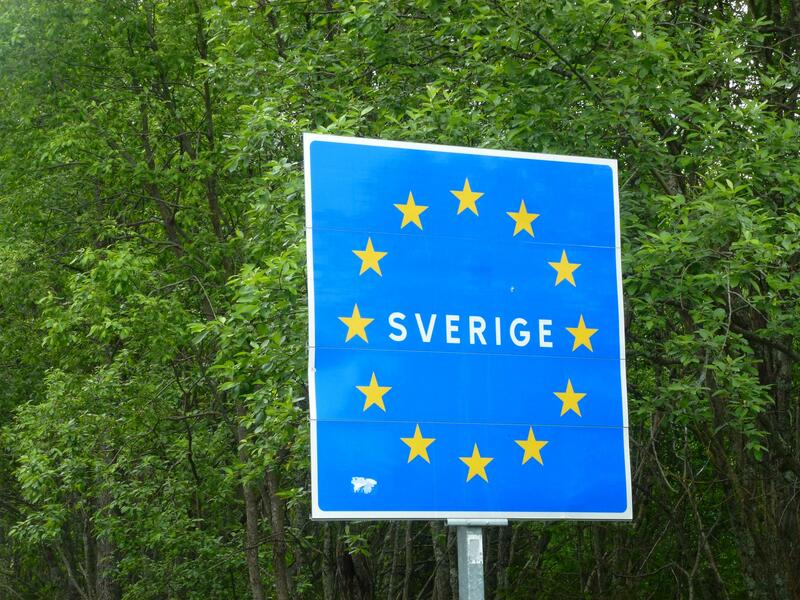 It is very hard not to notice how the Swedish people appear to have a pride in the places they live and keep them immaculately. 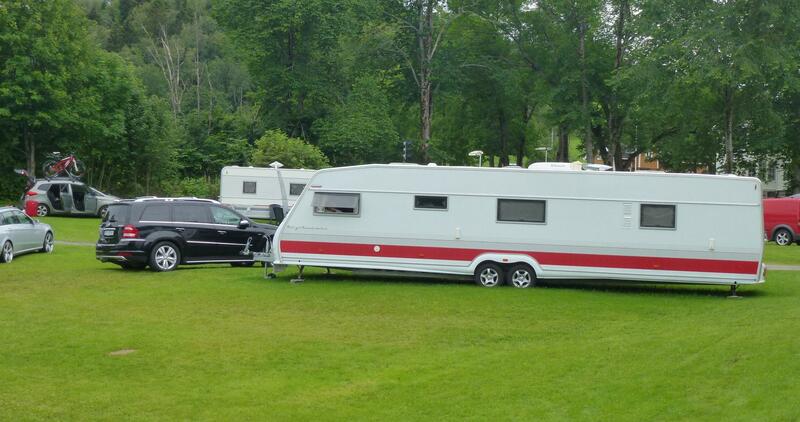 Houses are freshly painted, lawns are always well mown, we haven’t seen any rubbish or tipping The other thing its been hard to miss is the size of the caravans here, not just big but often off the scale of caravans as we know them. 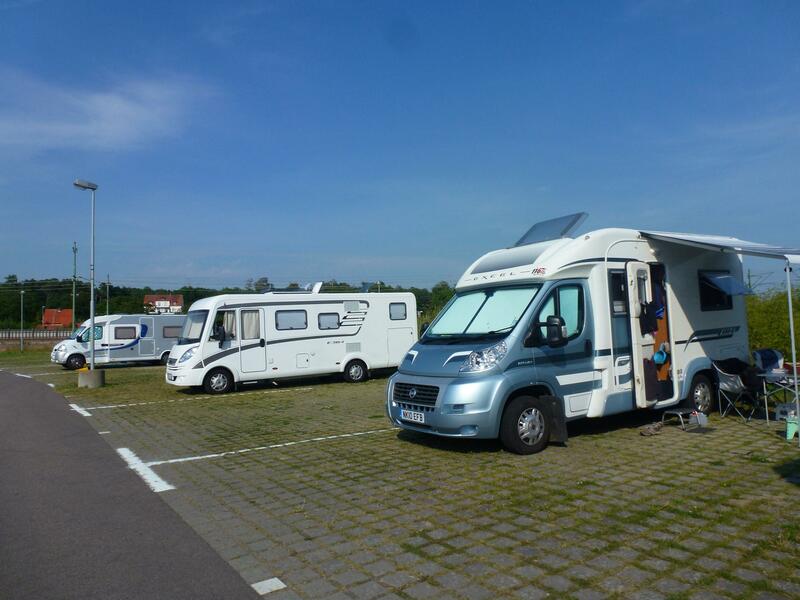 The Swedish Kabe is king here in motorhomes and caravans – we have seen several of the size of the one below – they don’t do small here.